web | Can you dig it? VW iPod adapter: Why won’t it just work the way I want it to? This pretty much sums up a lot of users’ frustration with product/web usability. You gotta wonder: why aren’t these guys talking to each other or to us? When I came across this cartoon I couldn’t help thinking of the iPod adapter in my 2008 VW Passat. After years of consumer requests, car companies are finally providing an AUX adapter so drivers can easily plug in their portable MP3 players. If you are an iPod fanatic like me you might actually consider getting a new car just so you can get rid of that old cassette or FM adapter that used to be required to play your device. –Your ipod is inserted into a small pillbox-sized compartment within your glove box. No wires are needed in the most current setup since it plugs directly into the “male” end of the iPod adapter. Broken: you can’t control the iPod from the iPod itself when it is connected. Even someone on the passenger side must remove the ipod in order to see the screen and once removed it turns off. –After plugging it in you can only choose from five playlists that you create ahead of time (numbered 1 thru 5) or play your entire iPod song list (number 6) . Broken: You cannot listen to albums, artists or random songs. You can’t reach playlists beyond the first 5, which are set up in alpha order (sorry ZZ Top fans). –To “shuffle” songs, you have to start the iPod in shuffle mode and let it play one or two songs. Broken: If you don’t move the audio selector to “CD 6” quick enough to get it to start playing, the adapter turns off “shuffle” and you get an alpha sort of your music starting with “A.” I like to hear ABBA once in a while but, please, not everytime I get in my car. What’s amazing is that VW has completely thrown out the intuitive features and interface that Apple has painstakenly set up that makes the iPod experience so pleasurable. They’ve put “clumsy mitten-hands” on the iPod interface without any thought about user preferences or desires. I can only conclude that these choices were made by engineers that were looking to add car audio features not currently offered by competitors but were not considering what people like about the iPod itself. They would have been better off creating less car audio functionality and letting the driver decide how best to use their own iPod (i.e., just put an AUX jack in the middle console next to the driver that gives us easy access). 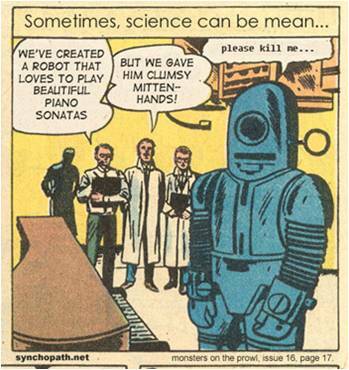 Instead, we end up with a very sad robot indeed. The lesson here is that if you can’t match or improve on an existing well known interface, half-measures are worse than no measures at all.